Project obstacles and solutions: Foamcraft is a worldwide leader in foam fabrication products, particularly for the furniture and medical industries. 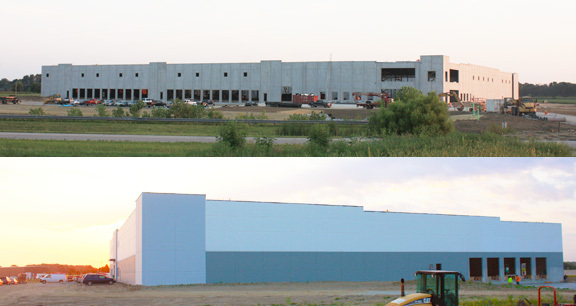 Increased demands led them to build a new distribution facility in Greenfield, Indiana. The new space added 70,000 square feet to assemble and ship their products. Peterson Construction Group was selected as the general contractor and Elbrecht Concrete finished all of the concrete on this job. The new facility had a quick turnaround. From the point ground was broken on the new site until the plant was opened for business was a mere 10 months. It was important that every step in the construction process be performed on time and accurately. To help speed up the concrete floor pours, IMI QC/QA worked with the site engineer to produce a blended coarse aggregate mix. This eliminated the need to place welded wire fabric. IMI delivered 2,000 yards of 4,000 psi concrete for the floors of the new facility. This was leveled using a laser screed. For more information on pouring warehouse floors without steel reinforcement, contact the sales representative for the concrete plant nearest your location. Click here.